Grand Junction, CO-The Voyagers built an early lead with five runs in each of the first two innings before hanging on late to claim a 12-9 victory over Grand Junction in game one of the Pioneer League Championship Series Tuesday night at Suplizio Field. Great Falls (1-0) is one home win away from capturing its first league championship since 2011. Grand Junction (0-1) is playing in the league championship series for the first time in franchise history. 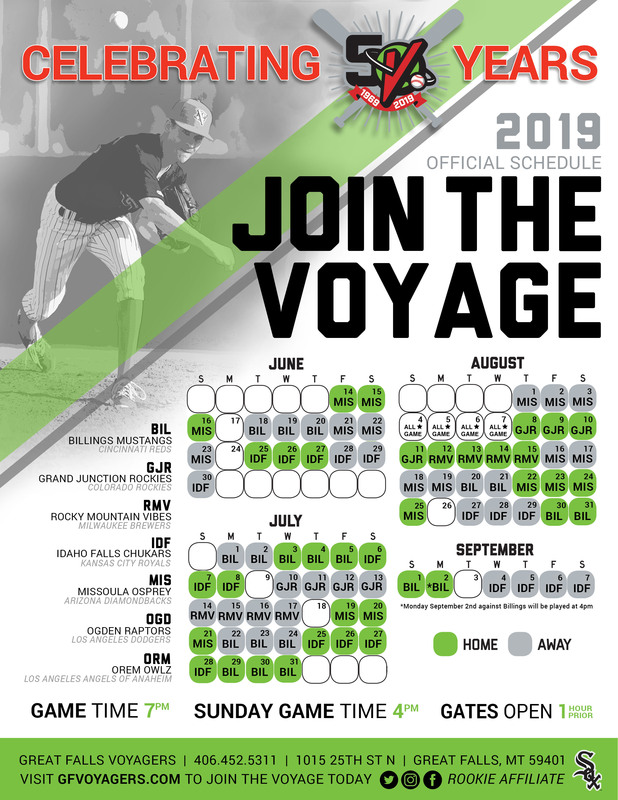 The Voyagers went 2-1 at home against the Rockies in the regular-season. Both wins were shutout victories. The Voyagers sent nine men to the plate and set the tone with a five-run first. Travis Moniot led off the game with a base hit to left. Lenyn Sosa reached on an infield error. Romy Gonzalez delivered the first run with an RBI single to right. Bryce Bush followed with a three-run home run spanked deep to left-center. After Amado Nunez singled, a two-out RBI double to right-center by Gunnar Troutwine made it 5-0. The Rockies responded rapidly with a three-run bottom of the first. The first run scored on a bases-loaded walk of Niko Decolati. It was the fourth walk of the inning. A two-out, two-run single to center from Javier Guevara closed the gap to 5-3. Great Falls kept the pressure on with a five-run second as well. Lenyn Sosa reached base with a one-out single to right. Romy Gonzalez picked up an infield single. Bryce Bush followed with a walk. Amado Nunez drove in Sosa with a line drive sacrifice fly to left. Bryan Connell brought in the second run with a base hit to center. Ryan Fitzpatrick then capped the inning with a three-run home run planted high and deep to left-center for a 10-3 cushion. Grand Junction did not go quietly. The Rockies sent 10 batters to the plate in a five-run third. Grant Lavigne led off with a walk. Niko Decolati followed with a two-run home run up the right field line and over the wall in the corner. Later in the inning, a bases-loaded hit-by-pitch of Hunter Stovall made it 10-6. Coco Montes produced a two-RBI single in the hole to left and it was 10-8. The lead was cut to one after Stovall led off the bottom of the sixth with a solo home run guided over the wall in right-center. The Voyagers scored the game's final two runs in the seventh. Ryan Fitzpatrick led off the frame with a missile launched deep to left for his second home run of the night. Gunnar Troutwine then walked and later reached third on a Travis Moniot single to right. A balk brought Troutwine home for a 12-9 lead. Great Falls outhit Grand Junction 16-to-11. 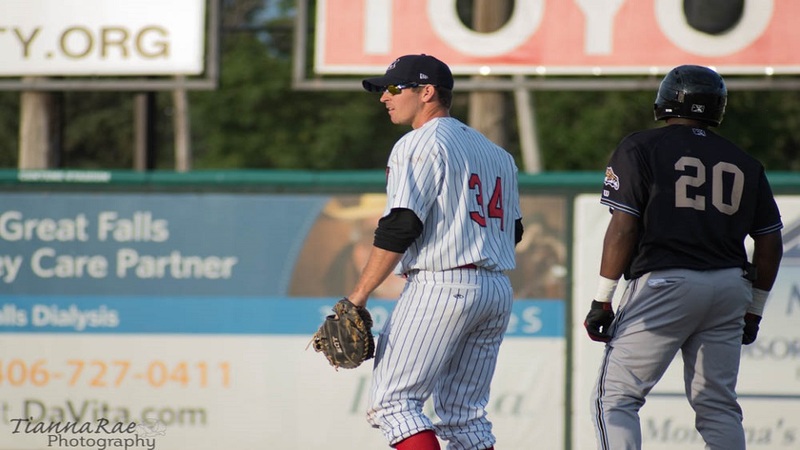 Ryan Fitzpatrick went 3-for-5 with the two homers, four RBIs, and two runs scored. Travis Moniot and Romy Gonzalez both collected three hits as well. Hunter Stovall had two hits, two RBIs, and two runs for the Rockies. Niko Decolati drove in three. The two clubs combined for five homers. Lane Ramsey posted his second playoff win in relief. Ramsey (1-0) worked one inning and gave up one hit with one strikeout and one walk. Eris Filpo took the loss in his start for Grand Junction. Filpo (0-1) lasted just one-and-a-third and allowed seven runs (five earned) on seven hits with one strikeout. Nick Johnson notched his second postseason save. Johnson pitched the final two innings and yielded one hit with three strikeouts and two walks. Great Falls plays game two of the PLCS at home Thursday night. First pitch at Centene Stadium is scheduled for 7 o'clock. Gates open at 6 p.m. For 2018 playoff tickets and promotional information, call 406-452-5311 or visit www.gfvoyagers.com.